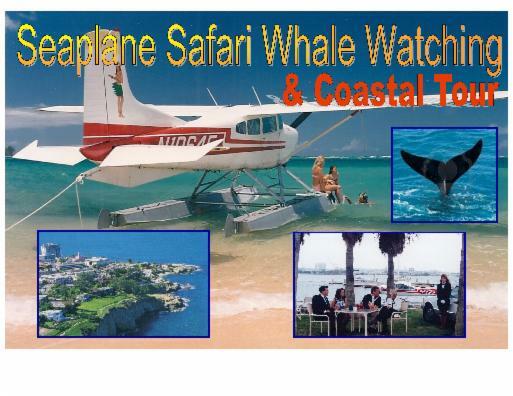 "Whale Watching" Safari and Coastal Seaplane Tours are during the California Grey Whale winter migration December through April each year. 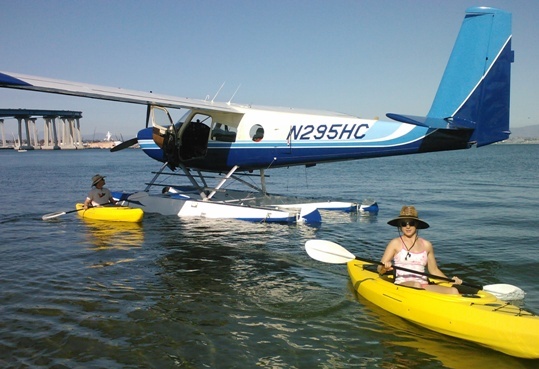 Join us for an exciting Seaplane Safari on our popular San Diego Bay and Coastal Aerial Tour. You will see why San Diego is America’s Finest City. 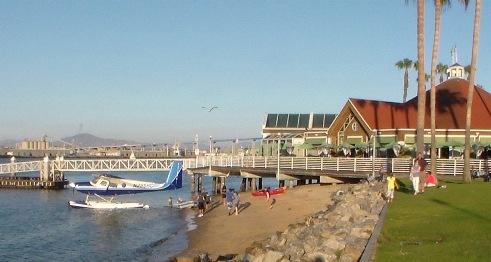 Your journey will include a thrilling seaplane takeoff and landing from beautiful San Diego Bay. Seaplane and Kayak Combo Tour packages are available. Please click on Reservations to see our Tour Prices. Our Seaplane Safari is perfect for a first date, a Birthday celebration or special Anniversary. During our seaplane adventure you will see unparalleled views of world famous beaches and sights unique to San Diego, including our picturesque downtown waterfront and Seaport Village, the Midway Aircraft Carrier Museum, Petco Park, San Diego’s World famous Zoo & Balboa Park, Coronado Bay Bridge, Coronado Island & the Hotel Del, Sunset Cliffs, SeaWorld, Pacific Beach, La Jolla, Mission Bay and more. Join the fun of seeing beautiful sunny San Diego from the air. Enjoy the thrill and excitement of a seaplane takeoff & landing on San Diego Bay. Learn to fly a seaplane. The total cost of a seaplane rating (instruction) depends upon your flight experience & the seaplane you choose to use for your flight lessons. Please call for more detail. A kiss . . . maybe love is 'in the air'. In the photo boxes below - La Jolla Cove, dinner on San Diego Bay after a Safari and a great Blue Whale starting its deep dive: Bring along your friends, they will have fun too. 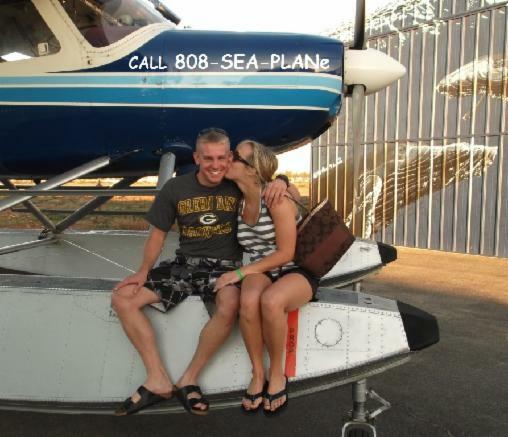 Below Karen & David enjoy a private beach after a flight lesson..
Have some fun in the sun . . .
You will be surprised how easy it is to learn to fly a seaplane. Call for more details 808-732-7526. 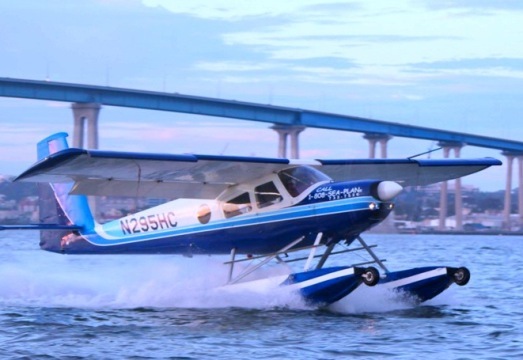 See more photos and videos by clicking on the top of this page and visit the other web pages for our San Diego Seaplanes website. 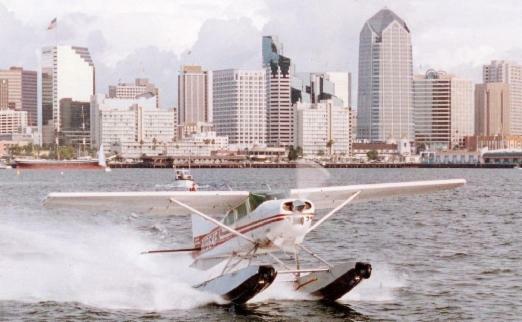 San Diego Seaplanes take-off on San Diego Bay in photo below.